RSM Federal, a government consulting, sales, and business coaching firm, announces today that it has signed a strategic partnership with Govology. 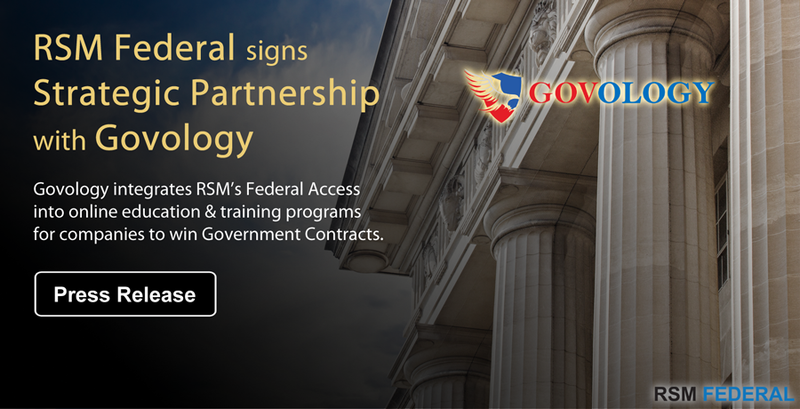 The partnership allows Govology to expand their online training platform for government contractors. Govology has integrated RSM’s Federal Access (FA) platform into their “Accelerator” and “Advisor” solutions and services. “What excites me most about our relationship with RSM Federal is that we are now able to provide small business government contractors with the most comprehensive mix of training, resources, and support under one roof. Combining the Govology and Federal Access platforms allows us to accelerate a contractor’s success in the market by providing every ounce of education and training they need through one tool. This means that our clients are able to achieve in months what it takes the average business years to accomplish,” said Carroll Bernard, Govology Co-Founder and CEO. The Govology community provides companies that currently sell or want to sell to the federal government with weekly insight newsletters, tips, podcasts, live training webinars (NCMA Accredited), on-demand webcasts, e-courses, and expert forums. With the integration of Federal Access, we’ve added more than 1,000 techniques and strategies with hundreds of marketing, sales, teaming, proposal templates, and other resources that a company needs to sell to the government. Each template is supported by training videos, white papers, weekly video playbooks, the podcast Game Changers for Government Contractors, and The Government Sales Manual. “We are excited to announce this strategic partnership with Govology. This relationship is over a year in the making. This partnership is the first of several major announcements we are making in 2018. This partnership will allow both companies to increase the value of our respective services to new segments in the market.” – Joshua Frank, RSM Federal’s Founder and Managing Partner. RSM Federal, founded in 2008, is a government consulting, sales, and business strategy and coaching firm that helps companies win government contracts. RSM Federal’s products, programs, and services deliver cost-effective and high-value results. A multi-award-winning company, RSM Federal works with small and mid-sized companies to accelerate and win government contracts. The Federal Access platform is an online platform designed to help government contractors accelerate their entry and growth in the government market. Federal Access provides companies with several hundred templates, training videos, webinars, podcasts, and SME email and phone support. These resources encapsulate more than 1,000 techniques and step-by-step strategies for winning government contracts. RSM Federal’s clients and members have won more than $2 billion in government contracts the last five years. Govology is a collaborative community passionate about educating, connecting, and supporting small business teams to help them grow through opportunities in the government marketplace. They deliver high-quality training from award-winning, well-respected, and highly recognized federal contracting experts from across the nation through weekly webinars and a growing library of 60 courses available online, on-demand, 24/7. By providing training in areas such as accounting, legal, sales, marketing, teaming, HR, Contract Management, Finance, and Cyber Security, Govology’s holistic approach to training supports every member of a small business team to help them stay capable, competent, and compliant.